The UN Security Council has unanimously endorsed the so called “roadmap” which envisages a Palestinian State by 2005 with its sponsors, hoping that the decision would breathe new life into the stalled Middle East peace process. A senior Hamas leader said late last night that the Islamic resistance movement had officially received an invitation to attend peace talks with the Palestinian leadership. The talks would take place in Cairo on December 2. 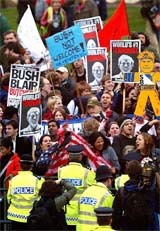 US President George W Bush and British Prime Minister Tony Blair today defended the attack on Iraq and condemned the ghastly bombings on British targets in Turkey, even as thousands of protesters marched through central London in a show of anti-US and anti-war feeling. US President George W. Bush watches British Prime Minister Tony Blair pause during a joint Press conference in London on Thursday. 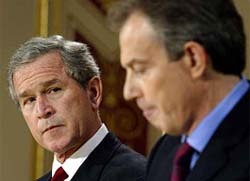 Bush and Blair stood united on the war on terror and condemned the bombing in Turkey which killed over two dozen persons. The defence in the Air India trial traded its final barbs with a key prosecution witness, who emotionally defended her claim that Ripudaman Singh Malik confessed to the 1985 bombings. Prime Minister Atal Bihari Vajpayee would take part in the SAARC summit here in January, but would not have bilateral talks with any Pakistani leader, a Private Pakistani TV network which interviewed External Affairs Minister Yashwant Sinha said today. In a development that could have major implications on his singing career, the authorities in California have slammed 45-year-old "King of Pop" Michael Jackson with "multiple counts" of child molestation, issued arrest warrants, asked him to surrender to the Santa Barbara Sheriff and hand over his passport. The “roadmap” was drawn up by an international “Quartet” comprising the US, Russia, European Union and United Nations Secretary-General Kofi Annan in an effort to revive the peace process. It lays down steps that both sides should take to achieve the goal of Israel and Palestinian state living side by side in their internationally recognised borders in peace and security. It calls for cessation of violence by Palestinian and freezing of building of settlements on occupied territories by Israel. But the continued cycle of suicide bomb attacks against Israel and Tel Aviv’s prompt retaliation have brought the progress to a halt. However, the US believes that the installation of new Palestinian Prime Minister Ahmad Qorei might help resurrect the process. Russia wanted the council to put its seal of approval as soon as it was presented to the parties and accepted by them in the Aqaba summit in June but the council did not go beyond welcoming it. After the vote, Russian UN Ambassador Sergey Lavrov said he did not think that the endorsement would radically change “everything on the ground” but he expected that the council action would make the process irreversible. Palestinian observer Nasser al-Kidwa welcomed the resolution and saw in it first involvement of the council in the political process in the Middle East. Israel, he said, was prepared to implement the ‘road map,’ provided it finds in Palestine a willing party to “eradicate terror” and committed to peace. In the final compromise version, the resolution couched the condemnation of militant organisations and of Israeli retaliations in general terms without mentioning any names. Israel does not feel bound by the UN Security Council’s unanimous resolution on the internationally-backed “roadmap” for peace, Deputy Prime Minister Ehud Olmert said today. “It is possible that we will hold talks with the new Palestinian government on the basis of the roadmap but ... Israel does not feel that it is bound by the resolution,” Olmert told public radio. Mahmoud Azzahar was speaking to reporters following a meeting between Hamas leaders and a high-ranking Egyptian security delegation that arrived in Gaza early yesterday to mediate a ‘hudna’, or truce, between Hamas and Israel. Israel has said that it will not allow leaders from Hamas and Islamic Jihad to attend the talks. A large contingent of US expatriates, led by maimed Vietnam veteran Ron Kovic, marched through the West End behind a banner declaring, "Proud of my country, ashamed of its President." They were joined by hundreds of Britishers, including schoolchildren, who defied education authorities to take a day off for the protest, claimed an activist of the Stop The War Coalition, which organised the march along with the "Campaign for Nuclear Disarmament" and "Muslim Association of Britain". Mr Blair, meanwhile, speaking after a meeting with Mr Bush, called the Istanbul bombings on the British Consulate and London-based HSBC bank as the "latest terrorist outrage" and added that it would in no way lessen the two countries' commitment in Iraq. "Once again we must affirm that in the face of this terrorism, there must be no holding back, no compromise, no hesitation in confronting this menace, in attacking it whenever and wherever we can in defeating it utterly." Malik's attorney, David Crossin, closed out a gruelling seven-day cross-examination of the witness by attacking the woman's testimony that she and Malik loved each other and he was willing to confide his deepest secrets. ''I suggest, whatever your feelings were for Malik over the years, it was not a relationship that would lead to any intimate discussions,'' Crossin told the woman, whose name cannot be published because she is in a witness protection programme. Malik and co-accused Ajaib Singh Bagri have denied involvement in the bombing of Air India Flight 182, which exploded off the coast of Ireland on June 23, 1985, killing all 329 persons on board the Boeing 747. Crossin accused the woman of being motivated by bitterness over Malik's firing her from a job she loved, and said she crafted her story about his role in the plot from second-hand information she gleaned from newspaper articles. According to Geo TV, Mr Sinha said the Indian Prime Minister would attend the summit but would not hold any one-to-one meeting with any Pakistani leader to discuss bilateral issues. There was speculation here that Mr Vajpayee would meet his Pakistani counterpart Mir Zafarullah Khan Jamali, if not President Pervez Musharraf, to formally kickstart the composite dialogue. In the excerpts of the interview aired by the channel, Mr Sinha refuted Pakistan’s oft-repeated allegations that Indian consulates in the Afghan cities of Kandahar and Jalalabad were promoting terrorism against Pakistan and also warned that Islamabad would be held responsible if any staff members of the Indian missions in these two cities were attacked. A television network quoted a friend of his as saying that Jackson, who has been involved in such controversies earlier too, would surrender within a day. He is said to be "making arrangements in consultations with his attorneys." The bail is set for $ 3 million. Jackson had faced similar charges about a decade ago but the case was settled outside court and reportedly involved payment of millions of dollars.